Viewing many of the earliest illustrations of Central eastern California Indians one could not differentiate which tribal group the person in a certain area was. Many times the drawings were generic in nature that you could not tell if you were looking at a Yokut, Miwok, Washoe or Paiute person. So when we found one of the earliest books with illustrations of Yosemite Indians as Paiutes we were pleasantly surprised. 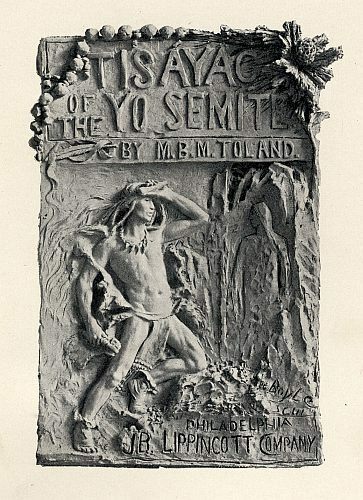 Cover of the book Tisayac of the Yosemite by M.B.M. Toland, published in 1891, the M.B.M. Yosemite Paiute women in Tisayac of the Yosemite by M.B.M. Toland, published in 1891, the M.B.M. There were three items we as Paiute people noticed right away. 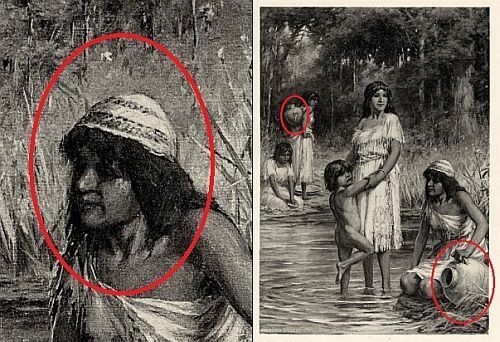 The Yosemite Illustration had a woman kneeling collecting water and on her head was a Paiute style basket hat with a Paiute design we call “tsotu’a”. 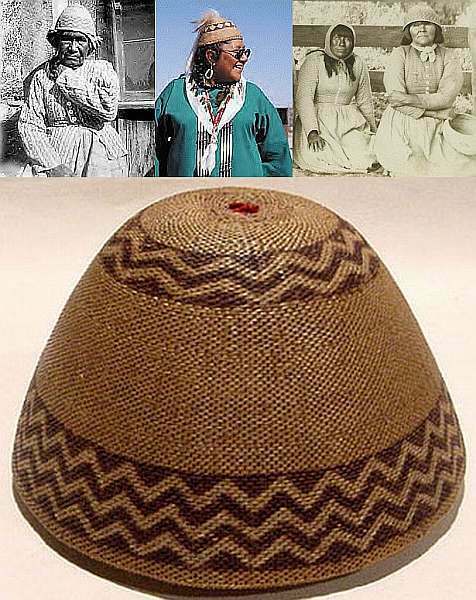 Paiute women were the only ones in the Yosemite area who wore those type of hats. She was collecting water in an “su-osa” a pine pitched tightly woven water jug only used by Paiutes in the area. There is another woman in the foreground with a “su-osa” in her hands. We knew this pre-1900 drawing was of Paiute people in Yosemite. Even in small excerpts like the one above you can decipher that the Indian woman in the stroy is Paiute because in the area they were the women who made and wore basket hats. “Mrs. Hill when asked particulars concerning a funeral, told of one she witnessed at an Indian camp (in Yosemite) when she was sent for by the chief and requested to write invitations to various Indians of the Piutes (Paiutes), Mono and the Yosemites. These were sent by messengers and in two days the funeral guests responded in person, dressed in their finest and most gaudy apparel, even the horses caparisoned in gaily hued blankets and bead embroidered saddles and hangings. It was eleven o’clock at night when Mrs. Hill arrived at the place chosen for the funeral ceremony. An enclosure, about fifty feet in diameter, was marked off at a convenient distance from the wigwams, and this was covered over with a circular roof made of pine and willow boroughs, interlaced together and fastened to the boughs stuck in the earth, the whole making a large tent, the cover a lace work of green, through which the moonlight entered in hundreds of spaces, and made ---ed shadows on the dancing Indians and the ground. The funeral pyre was made of Indian baskets, many yards of calico, in belts, and separate places, ribbons, strings of beads, and all things treasured of the Indians, were place upon it, when this ---y of the dead awaited the flames to consume the sacrifices of friends and relations. Then the torch was applied, and the ghostly dance commenced. They circled around and around the pyre, le—hy the pre---- dancers who take the intitative --------- ceremonies. The mourners stood -------- the fire, with ---ds entirely covered with baskets, which are made for such ceremonies, finely woven of the best grasses, and oval in shape. The ch----- mourner was a woman, whose husband had been executed at San Quentin for the murder of a white man*. She was dressed in white, and wore a head basket, such as would bring a hundred dollars in a curio shop to-day. The Indians went through the dance, one after another falling from sheer exhaustion, and being carried off by the master of ceremonies. This dancing, wailing, moaning and reeling continued for days until the departed was supposed to reach his destination, the happy hunting ground. The widow wore a basket hat, indicating she was a Paiute. “I am told that a Paiute woman (wife of the Paiute called Poker Bill) died in childbirth a short time ago and was buried here. A fine basket bowl was put over her head when she was buried”. Paiute basket hats; Southern Paiute elder, Modern Northern Nevada Paiute, Bishop Paiute woman, basket hat from around Mono Lake. The basket hat was an early item of Yosemite Valley Indian clothing. * The story above could be the wife of one of the Paiute men, like Piute George, who went to prison for attacking white settlers who tried to steal their land. Unlike the other tribes Paiutes had a harder time adjusting to and dealing with unscrupulous white men. 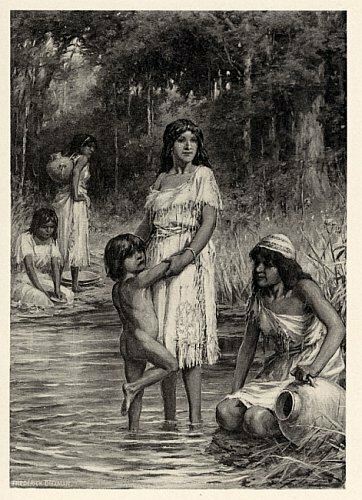 Paiutes were known for their pride and also for the chastity of their women. It was recorded that there were several incidents of Paiute men attacking or killing white men for certain transgressions like stealing land, kidnapping their women, cheating Indians for work, and avenging unprovoked killings.